Ten years ago, one of the worst space accidents of all time took the lives of seven astronauts when the space shuttle Columbia was destroyed. The 10th anniversary of the Columbia accident is Friday, Feb. 1, yet the memories for many are still fresh. People all over the world, including those heavily involved in the space program, and some who'd never given it a passing thought, remember where they were when they heard about the disaster. On Feb. 1, 2003, the shuttle Columbia was returning to Earth after a successful 16-day trip to orbit, where the crew conducted more than 80 science experiments ranging from biology to fluid physics. However, the seemingly healthy orbiter had suffered critical damage during its launch, when foam from the fuel tank's insulation fell off and hit Columbia's wing, tearing a hole in it that later analysis suggested might have been as large as a dinner plate. That wing damage proved fatal on landing day, when the orbiter was unable to withstand the searing heat of re-entry through Earth's atmosphere, and broke up over Texas, where shocked onlookers spotted debris from the shuttle in the sky as the orbiter disintegrated. 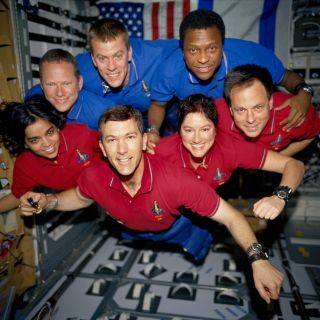 Columbia and its crew — commander Rick Husband, pilot Willie McCool and mission specialists Michael Anderson, Kalpana Chawla, David Brown, Laurel Clark and Ilan Ramon — were lost. The spaceflight disaster's anniversary comes at a somber time for NASA, which also marks the anniversaries of the fatal 1967 Apollo 1 fire on Jan. 27, and 1986 Challenger shuttle disaster on Jan. 28. Please use the comments below, or email spacephotos@space.com, to share your memories and thoughts of the Columbia disaster, and pay tribute to those who gave their lives for space exploration.